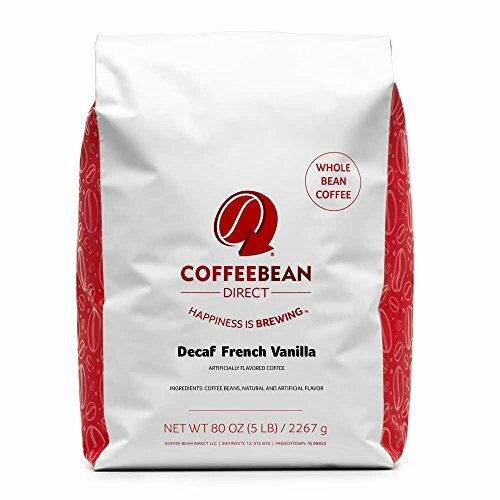 Knowing the best French vanilla coffee beans is a must for any coffee drinker who likes to break away from the plain black coffee and expensive, calorie-laden options out there. Sometimes you just want a little flavor in your coffee without all the extra sugar from syrups and flavored creamers (and sometimes you want to combine them, which is okay, too). 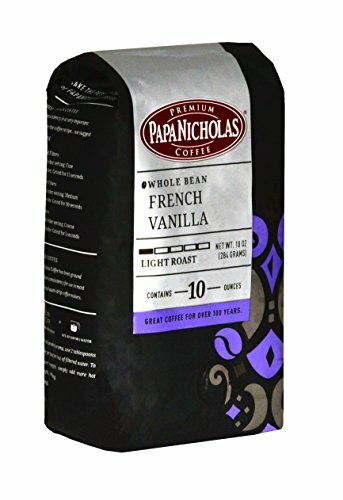 Here are some of the top French vanilla coffee beans. This one is slow-roasted right before it’s packaged to seal in its flavor. With over 500 reviews on Amazon for the brand as a whole (not just French vanilla), this one still gets a 4.1-star rating out of 5.0. This is a whopping 5-lb bag of light roast whole beans. The fact that it comes in whole bean form is, for some, a nuisance because it’ll have to be ground at home. However, it’ll maintain freshness longer if you grind it in batches. This one’s about $40.00 to $45.00 for a bag. This one is also available in Caramel Royale, Chocolate, Crème Brulee, Cookiedoodle, Chocolate Raspberry, Hazelnut, Highlander Grogg, Irish Cream, Jamaican Me Crazy, Seville Orange, and Vermont Maple Crunch, so feel free to mix it up if you like the brand. If you’re shopping on Amazon, most are available for Prime shipping and you can save five to 15 percent by subscribing. Believe it or not, your happy little corner grocery store probably has the coffee you’re longing for. Isn’t it nice when a best-of option is so easy to get your hands on? 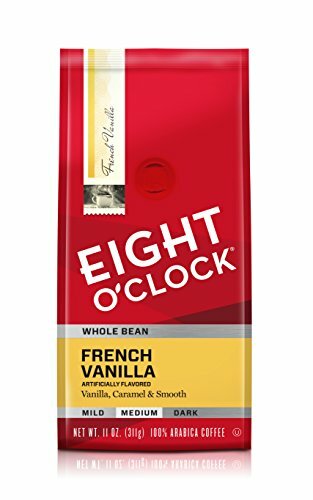 Eight O’Clock Coffee’s French vanilla offering scores a 4.8 at Walmart.com with almost 50 reviews. There are 11 ounces of coffee per bag. Expect to pay around $12.00 for this. You may be able to find it less, though, depending on where you shop. This is made from 100 percent Arabica beans and is medium-roasted. Some reviewers report not being able to find it in stores, so you may have to order it online. Hopefully, that won’t be the case in your town, though. This one falls a bit behind the others, with only about a 3.7-star rating and around 50 reviews on Amazon. However, it’s still not bad and it’s available in whole bean form for maintaining freshness. It’s a light roast, as the majority of flavored coffees are, and available in regular or decaf. This is where this one loses a few points. You only get 10 ounces of product but the average price is just over $15.00 per bag. The decaf version is almost $19.00 for an 11-ounce bag. Unless you try this one and really fall in love with it, there are more affordable options. This coffee habit probably won’t break you, but with the lower rating and higher cost per ounce, why not keep moving through the list if this one doesn’t make your taste buds sing? Not all flavors are available in both sizes. There are also regular coffees (not flavored) from this line, some of which are available in 2-lb, 1.75-lb, and 12-ounce sizes. This is a medium-bodied coffee made from organic Arabica beans. It’s made with natural vanilla flavors and has a creamy mouthfeel. Here, you’ll get a 12-ounce bag. With this one, you can choose whole beans if you’d like, but if you’re not worried about preserving freshness too much because you know it won’t last long at your home or office, or if you simply don’t want to grind them yourself, you can get pre-ground beans for auto-drip (flat filter), pour over and cone-shaped filters, French press, or espresso. This option is about $13.00 per bag, but you can subscribe on the website and save 10 percent. This is one of the few organic options on the list. The Volcanic Red site says the coffees are all made from “the top 1% high-quality Arabica beans.” It’s also available in decaf. This one doesn’t have a ton of reviews to go by, but it made the list for being organic and using natural ingredients (some have artificial flavorings). Volcanic Red also seems to take great care in selecting the beans for their products. Here’s another medium-roast option. It veers toward the lighter end of medium, but that still makes it a darker roast than a lot of French vanilla options. This one’s relatively easy to find, too. Not only that, but you can peruse through dozens of reviews for this one on several different sites because it’s not one of the more obscure options. Though personal preference will always play a big role in “best of” determinations, you’ll be able to get a pretty good idea of what you’re getting with this one when you check out the 75+ Amazon reviews (4.5 out of 5.0 stars), a handful on the New England Coffee site (5.0 rating), and more. Price varies, but you can expect to pay right around $1.00 per ounce on Amazon, but in some cases, it’s listed as an add-on item for much, much less. In general, it seems to be less on the New England Coffee website compared to Amazon’s regular prices, but it may be roughly the same once you factor shipping costs in. It’ll depend on Amazon’s price at the time, whether or not you’ll get free Amazon shipping, and where you live (to calculate shipping from the New England Coffee site). There’s also the possibility that you don’t even have to order it. You can find this brand in most grocery stores, Walmart, etc. It’s especially inexpensive in ground form (11-oz) bags at Walmart, for example. There, you can get a bag for around $4.00. This one’s a winner because of flavor, but also because of its price. New England Coffee Company has been doing things largely the same for over 100 years. That kind of staying power is a clue that they’re definitely doing something right. The 100 percent Arabica beans come from Central America, South America, Eastern Africa, and the East Indies. Unless you’re willing to buy online, this one will be hard to come by for most people. 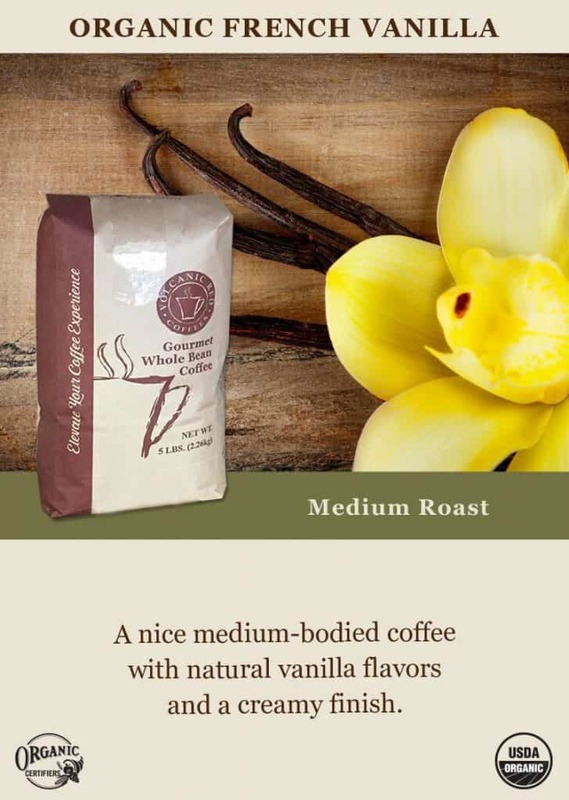 This coffee is made from 100 percent Arabica beans and available in regular or decaf. You can get a 12-ounce bag of auto drip grind, espresso grind, or whole bean coffee. Expect to pay about $9.95 per bag, plus shipping. This seems to be about the average cost. Lower than some but not quite as low as the New England Coffee Company option. If you like the French vanilla, you’ll probably be interested in some of their other flavors, like French toast and Buttercream Cupcake. It sounds like they make it easy to have your dessert with coffee, guilt-free because it’s all in one delightfully-flavored cup. 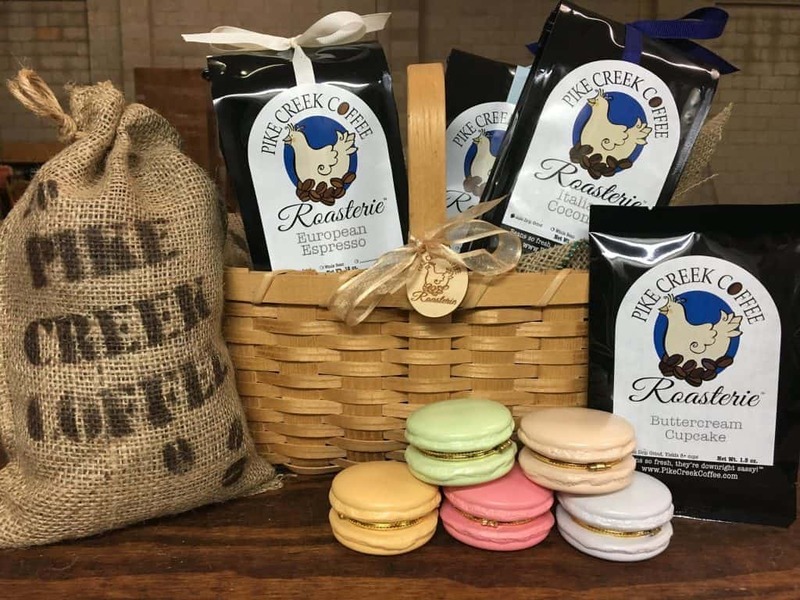 If you’re looking for the best French vanilla coffee beans to give as a gift, this one might be it. Special care is taken to make the package look nice, from the hen on the front to the blue grosgrain ribbon that ties it all together. The bag itself is the typical resealable, foil-lined type a lot of coffees come in to help seal in freshness. If you’re throwing a party and want to have small bags (enough to make 8-10 cups) of French vanilla coffee as favors, they’ve got you covered there, too, with an even more appropriate custom label for the event. You’ll need to order at least 20 favors, though. There’s a process that will help you find the best French vanilla coffee beans without wasting a lot of time and money. See which beans are available from brands you can purchase locally. You may not see whole bean options in all the grocery store aisles, but if you can find the pre-ground version of the same thing you were looking for, try that one first. If you’re relatively happy with that, there’s a good chance you can be even happier ordering the whole bean version and grinding it at home. If you don’t like anything available near you, start looking into the ones that are only available online and narrow it down to the ones that sound best. Experiment with different roasters and you’re sure to find your personal favorite in no time.